Social Security social security administration Social Security: A Great Tool for Your Whole Life! Social Security: A Great Tool for Your Whole Life! The United States of America is one of the many nations that provide Social Security to its citizens to support them financially whenever the need may arise. It is the common term which is used for the Old-Age, Survivors and Disability Insurance program (OASDI) which is under the jurisdiction of Social Security Administration. This program came into existence when in the year 1935 President Franklin Roosevelt signed the Social Security Act. This program is principally funded through Federal Insurance Contributions Act tax (FICA) and Self Employed Contributions Act Tax (SECA) which are the payroll taxes which the Internal Revenue Service (IRS) collects. These taxes are then deposited to the Federal Old-Age and Survivors Insurance Trust Fund and the Federal Disability Insurance Trust Fund, which are the Social Security Trust Funds. How is Social Security collected? The funds for Social Security are primarily collected through the salaried income of people and this amount is fixed and determined by law according to the tax rate table and according to the data, in 2018 maximum amount that could be taxed from the income of a person was $128,400. At present, maximum people i.e. the legal residents of US have their individual social security number which they can use to avail a number of services and monetary benefits from the government if they are eligible for them. Therefore, the people, whether they are working or even not employed in any job do possess the social security number as it is also mandatory because it is required by almost all the companies, businesses, and even to get enrolled in school, college, get the insurance claim, get your passport or driving license made. 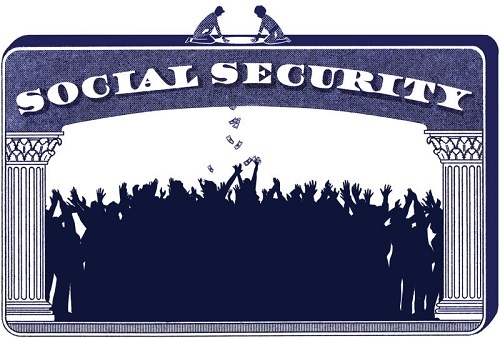 Must Read: What is Social Security and Importance? The US government collects a large amount of fund from the taxes and then spends a large chunk of it in form of social security. Alone in the year 2015, the expenditure under the Social Security was $750.5 billion for the OASDI and along with $146.6 billion under DI. Though there has been some criticism of this government scheme, still the data and studies show that it has reduced the poverty rate from 40% to below 10% for the Americans aged 65 years or older. when a baby is born, many of the parents go ahead and apply for the Social Security number for their child through the hospital itself and when in future the baby grows up and needs it, it is already there, thus saving the hassle. Also, when people get the social security number at birth and then name their child, the government is able to record the name for their data and they can reveal the most famous or unique baby name in the specific year. when an adult has to get employed in any place, it is commonly expected of them to provide their social security number to their employer as it is helpful in preventing or at least reducing the chances of fraud and provides the earning record along with better accuracy for the person’s own benefit. This also makes it easier for the person’s employer to collect Federal Insurance Contributions Act (FICA) with holdings so that they can report the earnings electronically. This is necessary so that the government can track the earnings of a person so that they may earn their social security retirement, disability benefits and even the survivor’s coverage for the person and their family. It is pertinent to know that a worker is required to earn social security credits – up to four credits each year and 40 credits are required which translates to 10 years of work so that they may be eligible for retirement benefits. it is a common practice for women to change their last name when they get married or maybe get divorced, so when this does happen, you should get your information updated in the social security records so that the earning can be recorded properly for the person’s own benefit. there is hardly anything more tragic than becoming disabled due to any number of reasons which can hinder your ability to live your life normally or even get an employment thus affecting your financial stability. This is where social security disability benefits can provide economic support to the disabled workers, even the family members who are dependent on them, this also includes the wounded warriors. if a family loses a loved one then their living spouse – husband or wife, and the children are entitled to receive financial support under the survivor’s benefits that is available under the social security scheme. The funds under this depend on the worker’s age when they pass away. Also, the children who are not married and are under the age of 18 are eligible to get this benefit. when a person retires, they may be worried about the financial implications in the future but if you have your social security number then you do not have to worry of living the rest of your life in paucity. It is important to be aware of the benefits that Social Security has and the number of ways it supports the people with limited income or resources due to disability, the people who have retired get to live their lives without getting into the clutches of poverty. This is the highly successful government scheme that stays with you right from your birth and even after your death to support your loved ones.